The shower heads that come factory fitted in new RVs are surprisingly poorly designed. I’ve had a look at a range of shower heads that all offer water saving mechanisms that you would expect as standard for an RV shower head. 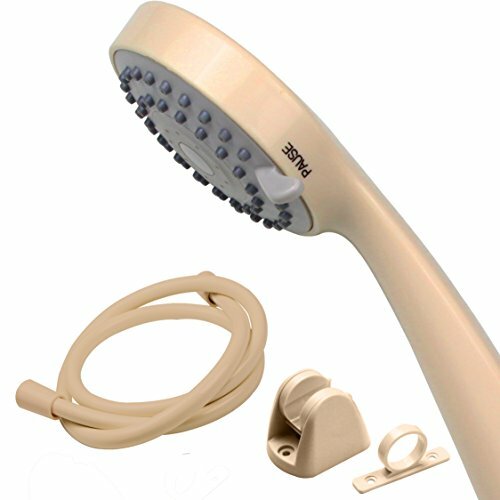 My top pick is, in my opinion, the best but it is also close to twice the price of the next best option, so if you spend a good deal of time in your RV and you really want the best shower head on the market I’d go for the Oxygenics Shower Head With 60” Hose but if you can’t bring yourself to spend that much money then the PIH High-Pressure RV Shower Head and Hose is still a great choice. Do You Need a Full Off Setting? The first on our list is the Camco 43712 RV Shower Head. At first look, this shower head has a lot of features going for it. There are five spray patterns and an on/off slide button to help conserve water. It’s made by Camco which is a well-known company that specializes in RV gear. We’ve mentioned their products before, in fact, the Camco 41531 as one of our top choices for camping toilets. Let’s talk about the five modes first. 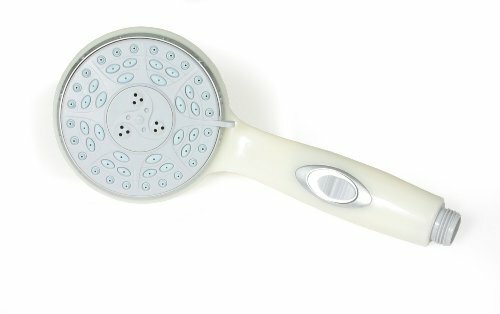 It is probably a little bit of an overstatement to describe this shower head as having five modes, at lower water pressures you don’t get much water flow when in the full massage mode. The massage mode is fairly basic as well and it can be a little awkward to change the settings especially with a wet hand. The on/off slide switch is a nice feature. Some water saving shower heads require you to hold a button down while you want the water to flow, so just being able to slide the switch makes for a more pleasant showing experience. However, as the off position is a fully off position, this can mean that the water becomes cold if you lave it in the off position for too long, so just take care that you don’t take too long shampooing your hair or you might get a cold shower. This is a pretty good low-cost option, but if you are willing to spend a bit more, there are better shower heads out there. This showerhead by PIH is a breeze to install and does a great job of increasing the water pressure, without any need to increase the power of your regulator. The main downside to this though is that with the increased water pressure you may find that you end up using more water, which can be problematic if you are dry-camping. The showerhead does come with three settings which are switched between by twisting the dial on the shower head. There is a wide spray, a directed spray, and a pause setting. This showerhead will not be kind to your water tank but it does make for a more pleasant showering experience than most factory-fitted shower heads. Unlike the other shower head, this one does not have a full “off” setting. It instead reduces the flow of the water to a trickle for while you are soaping up. This meant that the water stays warm, but it does mean it is not as effective at reducing your water use as other shower heads. One of the main reasons to buy a new showerhead for your RV is to get one that allows you to save on water by shutting the shower off while you soap up. There are two main ways to do this. The first one shuts the water off completely. The second one just slows the water to a trickle. Option one means that the water can get cold but is more effective. Option two will undoubtedly use more water but will keep it hot. A common question about shower heads for RVs is if they have a standard fitting. You will find that almost all shower heads have the same fittings. If they are anything other than standard it will be front and center on the listing. There are a few different ways of changing between the on/off settings. You may consider which mechanism you would prefer. The options are ones that have a dial at the top where the water comes out. The other options are slides or push buttons on the handle. This is really just a matter of personal preference. 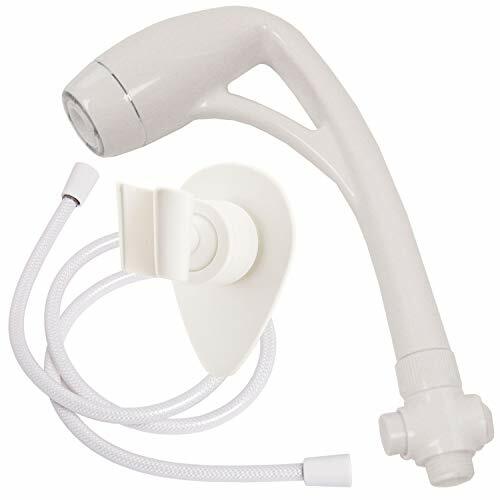 The Oxygenics Shower Head With 60” Hose is a fantastic shower head that will make your RV shower experience rival that of your home shower. The main problem with it is that you might enjoy your shower so much that you fill your grey tank up quicker due to spending so much time in the shower. If you don’t feel you can justify spending that much on a shower head then the PIH High-Pressure RV Shower Head and Hose delivers a good experience with the more water saving option of having a full “off” setting.